Is your small business really pre-approved for a $250,000 loan? Your smartphone rings and the screen reports this time the call is coming from Tennessee. You answer anyway. You don't have a small business so you hang up on the robocaller and immediately block the number, just like you have the dozen or so other numbers this operation has used so far. But what if you did have a small business, one that was struggling and in critical need of working capital? Would you be tempted to listen to the pitch and try to get to a human operator? If you did, you could fall for what is a growing and widespread scam that isn't particularly new, though its target is. Remember, scammers always try to target people who are desperate, because desperate people are usually the most vulnerable and most likely to use bad judgment. It can be a lonely person looking for a relationship or a family fighting off foreclosure. These days, there are plenty of desperate small business operators. The small business loan scam tries to convince its targets that they can easily qualify for a huge loan without having to produce years of financial data. This, of course, makes absolutely no sense because even well established businesses have to jump through numerous hoops to get much smaller loans from legitimate lenders. The robocallers, however, have no money to lend. They are after what little money you have left. The fees begin to get larger and more numerous, until the victim begins to realize he or she has been scammed. By that point, it's too late and the scammer disappears into the night. And it can get worse. The New York Times points out that as part of the “loan application” process, victims have handed over all manner of sensitive information, including Social Security and bank account numbers. 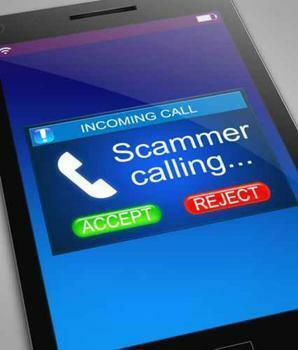 Whether you own a small business or not, a robocaller telling you that you have been pre-approved for a loan is a scam. Such news is too good to be true, and as has been said many times, when something is too good to be true, it's usually a scam.